Córdoba, Christopher Columbus, y Castañas. My week is coming to a close and I am ready for mi fin de semana! The weather has cooled down drastically and I am wearing my fall clothes! I love it! Even the leaves are changing color. Which brings me to the ‘Castañas’, otherwise known as ‘Chestnuts’. Castañas are cultivated throughout Andalusia and in season from October-December. Vendors set up shop with their little carts right on the streets of Sevilla. They actually roast the Castañas right in front of you and then place them in a paper cone. They are positively delicious and this little delacacy has become my new addiction. One vendor told me today that there are 4-5 varieties. Raquel, Manuel, and I are going to a ibérico jamòn festival on Sunday so needless to say, I will be doing a bit more R&D on this subject. Wednesday October 12th was ‘Día de Hispanidad’. Basically, for all intents and purposes, instead of celebrating Columbus Day on the second Monday in October like the United States, it is celebrated on October 12th. I had planned to go to Cordóba but my blah blah car driver canceled our trip due to rain. I was fine with the cancelation and rescheduled my trip to Cordóba for this Saturday. 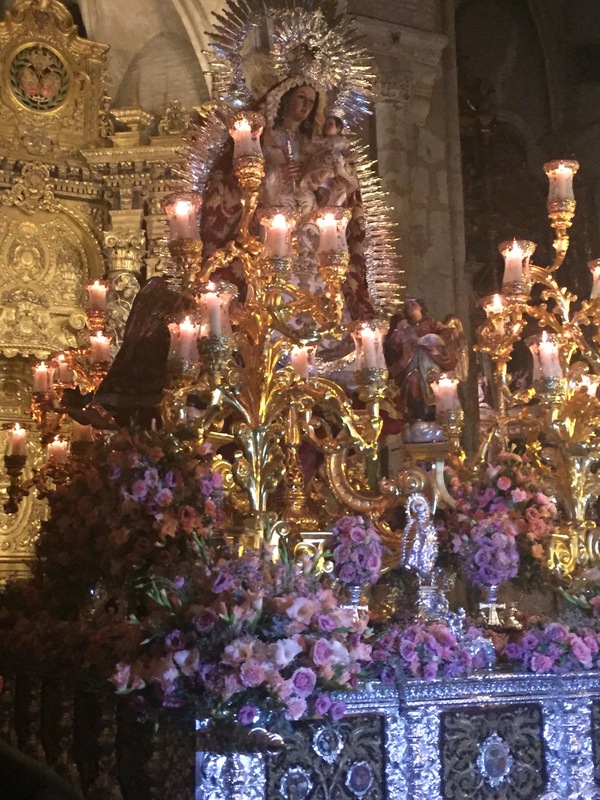 I thought since the final resting place for Christopher Columbus is in the Sevilla Cathedral, that surely I was in store for a huge procesion and all kinds of festivities. However this was not the case. After hearing this tidbit of information, I contimplated giving up completely on trying to figure out the Seviliano’s and their traditions. But instead, I think I will die trying. We all stayed at home and the rain carried on until nighttime. Gloria pretty much cooked all day, which is always such a treat. I wound up studying for 12 hours with only one break. At 6:00 I went to a absolutely beautiful church in mi barrio to see a procesíon. The churches in Spain are, in my opinion, by far the most spectacular in all of Europe. Simply breath taking. Madre de Dios del Rosario. Today MaryCmarmen taught me how to use the metro. It is quite simple and I didn’t end up in Portugal. I had really thought this to be a possibility. And I was certain that if it were possible, that I would manage it!